This Aviation Collectible is exquisitely Framed with double mattes and comes in a 1 ½ Matte Black Frame, exclusively produced by Planejunkie. 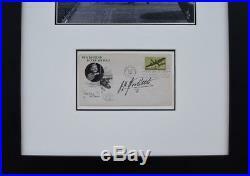 Dimensions: 15.25" x 19.75" Signature: Gen. Jimmy Doolittle (Original Signature - Not a COPY). James Harold Doolittle (December 14, 1896 September 27, 1993) was an American aviation pioneer. Best known for the surprise attack on Japan, Jimmy Doolittle actually changed both the civilian and military aviation world prior to WWII starting. Doolittle's most important contribution to aeronautical technology was the development of. He was the first to recognize that true operational freedom in the air could not be achieved unless pilots developed the ability to control and navigate aircraft in flight, from takeoff run to landing roll-out, regardless of the range of vision from the cockpit. In 1929, he became the first pilot to take off, fly and land an airplane using. Alone, without a view outside the cockpit. He helped develop, and was then the first to test, the now universally used. He attracted wide newspaper attention with this feat of. These accomplishments made all-weather airline operations practical and the instruments are still used today. A Reserve officer in the United States Army Air Corps, Doolittle was recalled to active duty during World War II. He was awarded the Medal of Honor for personal valor and leadership as commander of the Doolittle Raid, a bold long-range retaliatory air raid on the Japanese main islands, on 18 April 1942, four months after the Attack on Pearl Harbor on December 7th 1941. For planning and leading his raid on Japan. His citation reads: For conspicuous leadership above and beyond the call of duty, involving personal valor and intrepidity at an extreme hazard to life. He was eventually promoted to lieutenant general and commanded the Twelfth Air Force over North Africa, the Fifteenth Air Force over the Mediterranean, and the Eighth Air Force over Europe. We at Planejunkie have worked with famous aviators for 30+ years and inspect each and every signature we sell along with all First Day of Issue envelopes. I obtained this Cover from a long time Aviation Autograph Collector who has had this in his collection for over 35 yrs. He bought it from Al Zimmerman's Auctions in New York in 1984. At the time he bought it his auctions were the leading auctions in the U. He and his Brother Joe Merman were the guys to go to for these types of Aviation signatures. He was the leading guy on Aviation Signatures back then, way before the. Current so called experts decided to convince collectors they knew it all and if it didn't have a COA from them it wasn't to be trusted. 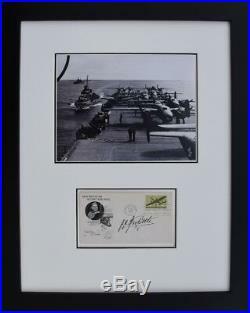 The item "B-25's on the USS Hornet Signed Jimmy Doolittle Framed Historical Photos" is in sale since Tuesday, November 28, 2017. This item is in the category "Art\Art Prints". The seller is "planejunkie007" and is located in Puyallup, Washington. This item can be shipped to United States, Canada, United Kingdom, Denmark, Romania, Slovakia, Bulgaria, Czech republic, Finland, Hungary, Latvia, Lithuania, Malta, Estonia, Australia, Greece, Portugal, Cyprus, Slovenia, Japan, Sweden, South Korea, Indonesia, Taiwan, South africa, Thailand, Belgium, France, Hong Kong, Ireland, Netherlands, Poland, Spain, Italy, Germany, Austria, Bahamas, Israel, Mexico, New Zealand, Philippines, Singapore, Norway, Saudi arabia, Ukraine, United arab emirates, Qatar, Kuwait, Bahrain, Croatia, Malaysia, Chile, Colombia, Costa rica, Panama, Trinidad and tobago, Guatemala, Honduras, Jamaica, Antigua and barbuda, Aruba, Belize, Dominica, Grenada, Saint kitts and nevis, Saint lucia, Montserrat, Turks and caicos islands, Barbados, Bangladesh, Bermuda, Brunei darussalam, Bolivia, Ecuador, Egypt, French guiana, Guernsey, Gibraltar, Guadeloupe, Iceland, Jersey, Jordan, Cambodia, Cayman islands, Liechtenstein, Sri lanka, Luxembourg, Monaco, Macao, Martinique, Maldives, Nicaragua, Oman, Peru, Pakistan, Paraguay, Reunion, Viet nam, Uruguay.